Lights are a fundamental part of graphical rendering since they determine the shading of an object and the shadows it casts. See the Lighting and Global Illumination sections of the manual for further details about lighting concepts in Unity. Type The current type of light. Possible values are Directional, Point, Spot and Area (see the Lighting Overview for details of these types). Baking This allows you to choose if the light should be baked if Baked GI is selected. Mixed will also bake it, but it will still be present at runtime to give direct lighting to non-static objects. Realtime works both for Precomputed Realtime GI and when not using GI. See the Global Illumination section of the manual for further information about lightmaps and baking. Range How far light is emitted from the center of the object (Point and Spot lights only). Spot Angle Determines the angle (in degrees) at the base of a spot light’s cone (Spot light only). Color El color de la luz emitida. Intensity Brightness of the light. The default value for a Point, Spot or Area light is 1 but for a Directional light, it is 0.5. Bounce Intensity This allows you to vary the intensity of indirect light (ie, light that is bounced from one object to another. The value is a multiple of the default brightness calculated by the GI system; if you set Bounce Intensity to a value greater than one then bounced light will be made brighter, while a value less than one will make it dimmer. This is useful, for example, when a dark surface in shadow (such as the interior of a cave) needs to be rendered brighter in order to make detail visible. Or alternatively, if you want to use Precomputed Realtime GI in general, but want to limit a single light to give direct light only, you can set its Bounce Intensity to 0. See the Global Illumination section of the manual for further information. Shadow Type Determines whether Hard Shadows Soft Shadows or no shadows at all will be cast by this light. Baked Shadow Radius If shadows are enabled then this property adds some artificial softening to the edges of shadows cast by point or spot lights (in theory, light originating from a point casts perfectly sharp shadows but this situation rarely occurs in nature). Baked Shadow Angle If shadows are enabled then this property adds some artificial softening to the edges of shadows cast by directional lights (in theory, parallel light rays coming from a truly “directional” source cast perfectly sharp shadows but natural light sources don’t strictly behave like this). Draw Halo If checked, a spherical halo of light will be drawn with a radius equal to Range. See also the page about the Halo component. Flare Una referencia opcional a Flare que será renderizado en la posición de la luz. Render Mode Importance of this light. This can affect lighting fidelity and performance, see Performance Considerations below. The options are Auto (the rendering method is determined at runtime depending on the brightness of nearby lights and current Quality Settings), Important (the light is always rendered at per-pixel quality and Not Important (the light is always rendered in a faster, vertex/object light mode). Use Important mode only for the most noticeable visual effects (eg, headlights of a player’s car). Culling Mask Utilice para selectivamente excluir grupos de objetos de ser afectados por la luz, vea Layers. Usted puede crear una textura que contenga un canal alpha y asignarlo a la variable Cookie de la luz. La Cookie va a ser proyectada desde la luz. La máscara alpha de la Cookie modula la cantidad de luz, creando luz y manchas oscuras en las superficies. Ellas son una gran manera de agregar mucha complejidad o ambiente a una escena. Todos los built-in shaders en Unity trabajan sin problemas con cualquier tipo de luz. No obstante, los sombreadores VertexLit no pueden mostrar Cookies ni Sombras. All Lights can optionally cast Shadows. This is done by selecting either Hard Shadows or Soft Shadows for the Shadow Type property of each individual Light. For more information about shadows, please read the Shadows page. Shadows from directional lights are explained in depth on this page. Note that shadows are disabled for directional lights with cookies when forward rendering is used. 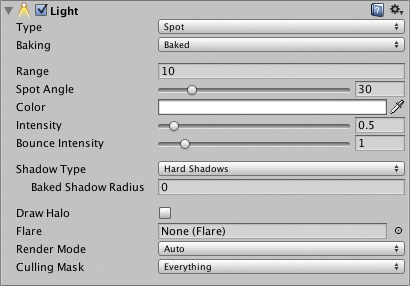 It is, however, possible to write custom shaders to enable shadows in such a case by using the fullforwardshadows tag; see this page for further details. Spot lights con Cookies pueden ser extremadamente efectivas para hacer que la luz venga de las ventanas. Point lights de baja intensidad son buenas para dar profundidad a una escena. Para un rendimiento máximo, utilice un sombreador VertexLit. Este sombreado solamente hace una iluminación por-vértice, dando un rendimiento mucho más alto en las tarjetas de gama baja. Las Auto Lights pueden emitir sombras dinámicas(dynamic shadows) sobre objetos lightmapped sin agregar una iluminación extra. Para que esto funcione las auto lights deben estar activas cuándo el Lightmap es baked. De otra manera, serán renderizadas como luces en el tiempo real.